The 29th Annual Sheridan House Golf Tournament was held Thursday, November 3rd at the Palm-Aire Country Club. 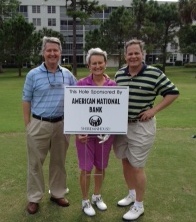 American National Bank was a Corporate Sponsor for the golf tournament that benefits Sheridan House Family Ministries. Sheridan House serves the needs of middle-school aged boys and girls, single parents, and families in need. American National Bank client Bill Carlson of Harbor Village Cleaners joined ANB President and CEO, Ginger Martin, and ANB EVP/COO/CFO, Moyle Fritz, and ANB SVP/Senior Lender, Rob McCracken on the links for a great afternoon of golf and fundraising for a great cause. For more information on Sheridan House go to http://bit.ly/vzJBEf. This entry was posted on Friday, November 4th, 2011 at 3:05 pm and is filed under Uncategorized. You can follow any responses to this entry through the RSS 2.0 feed. You can leave a response, or trackback from your own site.